Reviewed as the 'Best Royal Jelly in the UK' by The Mail on Sunday! Well Bee-ing UK are a small family business located in Manchester, UK, established in 2011. We have been using royal jelly for a range of reasons for decades. ​We have family in Bulgaria who own one of the oldest (est. 1909) and most reputable Bee Farms in Europe. Tried and tested Bee keeping expertise has been passed down through generations to produce the best European pure royal jelly guaranteed. If you are not 100% satisfied with our royal jelly at the end of the 30 day period, we will provide a full refund. We are unable to refund any shipping costs. Read more about our guarantee. T&Cs apply. On the day of harvesting, we apply a gentle filter to remove other bee debris to create 100% pure royal jelly. It is then frozen (never freeze dried) to -18C to create 'straight from the hive freshness'...and that's it! There is no better way of preserving it's premium quality ...that's why we don't sell capsules or freeze dried. Using organic production methods, ours naturally contains some of the world's highest 10-HDA levels. SHIPPING: Please select from the relevant box below for your shipping requirements - N.B. If you chose Next Day Delivery before 12:00 between Monday-Thursday, we will despatch your order the same day. We do not despatch on Fri/Sat/Sun. ​For optimum use, take a dosage of ¼-½ (1,250mg-2,500mg) tsp per day followed by a warm drink​. A daily dose can also be mixed in to yogurt, fruit juice. Inc. Free 2.5ml Syringe for accurate oral dosage and less mess. Pure Royal Jelly (aka bees milk/Gelée Royale) is a nutrient-rich mixture of protein, vitamins, sugars, fats and enzymes, made by young female (worker) bees for consumption of the hive. Only the Queen Bee eats royal jelly for her entire life, hence the name. Our Royal Jelly benefits people of all ages and, as a family, we have taken it in its raw, fresh, unprocessed form as a natural health supplement for decades for a variety of uses. This practise is called apitherapy and has been used since at least the time of Hippocrates, all over the world, over 200o years ago! ​It works for us and thousands of our happy customers...that's why customers have been coming back to us regularly for the 8 years we've been in business. Our customers all agree that it truly makes a difference! The perfect addition to a varied and healthy diet. Due to the clean environmental conditions and rich, organic, fertile soil, Bulgaria has the most diverse plant life in Europe. This gives high complex variations of pollen and nectar for our hard working honey bees to feed on, which is very important for producing premium quality, nutrient packed health products. 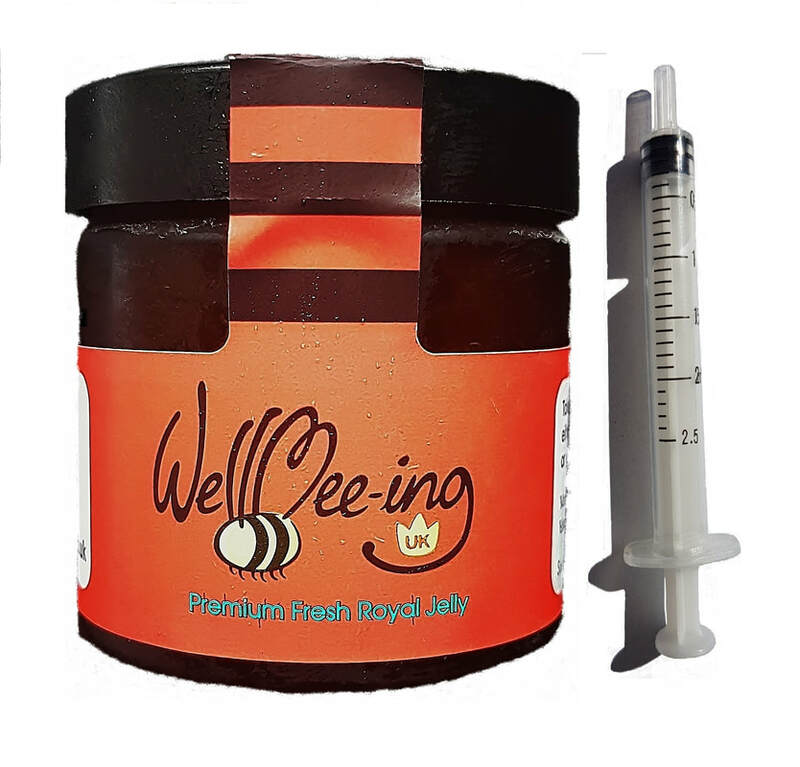 Since opening Well Bee-ing UK in 2011, we have never found a company that sells Royal Jelly sourced in the UK. If you can find a supplier in the UK with evidence of this, we will give you a free 50g jar. We thank you for your help in advance. Try our Luxury, Delicious Honey Bee Products Straight From The Hive. Click an image below for further information. Feel On Top of the World! Buy 1KG Royal Jelly for £400 including Special Delivery. Premium Quality Sent Pure and Frozen. ​Sent in a Cool box with Ice Gels for ultimate freshness! Buy the 1KG Frozen Royal Jelly bottle which will last approximately 20 months taking 1/4 teaspoon per day. Please contact us for the availability of the 1KG bottle! Next Day Guaranteed Service on the 1KG bottle is only available to UK RESIDENTS! IMPORTANT INFORMATION: If you are trying to conceive, please click here to read more before purchasing. When starting as a supplement, it is important to start with an incredibly small amount and build up to the min. dose of 1/4 teaspoon per day over a 5-7 day period to avoid (although rare) allergic reactions and other related side effects.